Last year saw the long-awaited releases of Doom 3 and Half Life 2, both sequels to hugely successful PC First Person Shooters, which both enjoyed rather predictable success as FPS fans hurried to snap up the latest must-have shooting fest. Arguably of equal stature in 2004s huge line up of FPSs was the original IP Far Cry. Developed by CryTek and using their impressive homegrown CryEngine, the game boasted the ability to render an entire square kilometre in real time, with all the trappings expected by todays tech savvy PC owners, including destructible terrain, dynamic lighting, advanced environment physics and motion-captured animation. As well as that, the sophisticated AI of enemies pushed them to frighteningly clever behaviour, such as use of terrain to their advantage, divide and conquer or group attack tactics, and calling in reinforcements, all based on their observation of the players movements. 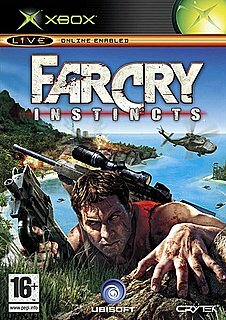 The deserved success of the Ubisoft-published title has led to the announcement that the game is coming to Xbox, in a console-optimised version called Far Cry Instincts. The game follows the storyline of its big PC brother, as Jack Carver, a man with a shadowy past, runs a boat chartering company in the beautiful archipelago of Micronesia. Escorting pushy journalist Valerie Cortez to the island of Cabutu seems like a normal enough gig, but as usual, everything goes pear-shaped and Carver finds himself drawing on all his old skills to survive. Like the original, the game features the same sophisticated engine. Use the huge space available to work your way through this non-linear extravaganza, making use of both sneaky stealth tactics and all out assault. Youll have to use the Artificial Intelligence of your foes to your advantage, luring them to where you want them or misdirecting them out of your way. Weather effects and night and day cycles make the game even more realistic. It's trouble in paradise for Xbox owners.